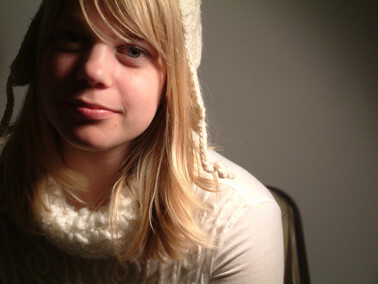 A very young woman, Basia Bulat delivers her songs with a striking voice, similar to fellow Canadian, Leslie Feist. But unlike Feist who on her last effort, Let it Die, made a successful effort to sing in a very detached and cool fashion, Bulat makes no attempt and uses her pleasing voice in a more natural style. Seeing as Bulat is so young, her musical path has yet to be determined; will she follow the path Feist is presently on or will she make a left turn onto the indie sidestreets that Feist herself trod on her debut, Monarch? At this point her songs show her youth and her influences, Joni Mitchell and Paul Simon , among others, but with other stated inspiration coming from Hispanic singer/ songwriters, Joan Manuel Serrat and Silvio Rodriguez, she just may surprise listeners with the route she takes in the future. Tonight (June 25th) in Toronto, Bulat will hold a cd release party at C'est What? * several more mp3s can be found here on her site in varying degrees of polish and sound quality. UPDATE: Go here and here for more up to date posts on Basia Bulat. Thanks for Basie Bulat, she is wonderful as is your revised site. A while back you posted Romantica which I loved and would have bought right away but they were on Rhapsody. My girlfriend went to highschool with this person. such a beautiful voice! thanks for sharing. and I agree.. great new layout! nice breathy riff on S & L's! I didn't pay attention much to this one at first, but then I listened again, and also to the others songs available for download at her website, and now i'm hooked. my only problem now, where to get the cd!? The only google hits i get are her site and yours! Thanks so much for this one. I still love sixeyes! I went to school with her great great great great grandfather. I am 109.